We're pleased to announced that ComponentOne Studio for Xamarin will be leaving beta with the 2017 v2 release. This release adds numerous bug-fixes, new controls, and new features. The new architecture is entirely cross-platform yet also relying on native APIs for better performance, compatibility, and size. We aren't dependent on SkiaSharp or other cross platform libraries which is the key to our superior compatibility, speed, and Xamarin.iOS/Xamarin.Android implementations. Additionally we're adding first class UWP support through Xamarin.Forms in the new architecture along with iOS and Android support. All of the great new features from the beta are present with a larger collection of controls. Studio for Xamarin now contains FlexChart, FlexPie, FlexGrid, Input, Gauge, Calendar, and CollectionView controls. Input has a lot of small improvements including a cleaner API and smarter editing capabilities (like scrolling into view when a control could become obscured by a software keyboard). 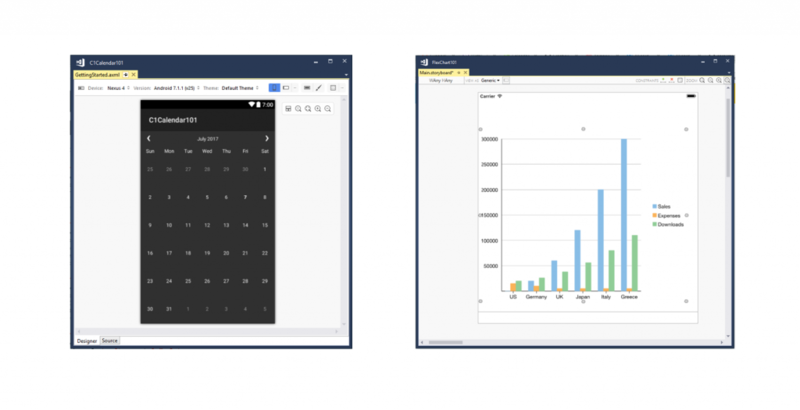 Our new version of FlexChart is based on the UWP version of the control, and shares it's DNA with that version. This means FlexChart and FlexPie are now encompassed in the same Chart library, and they make liberal use of ChartStyles in the same manner the UWP controls do. We'll be iterating on the Charting controls through the next release to bring in more features with UWP and more parity with the outgoing Xuni FlexChart. CollectionView has also been expanded upon with new Xamarin.iOS and Xamarin.Android libraries that make it easier to connect to the native list types (UITableView and RecyclerView respectively). Additionally, there are some new samples available for Xamarin.iOS and Xamarin.Android demonstrating this. We've also updated the CollectionView library with support for .NET Standard 1.1. This release also contains a huge number of fixes for controls introduced during the beta. Some features have been fully fleshed out in this release that previously had some issues (such as keyboard support for FlexGrid), and we've worked hard on fixing bugs that have been reported over the past few months for the beta. The 2017 v2 versions of Calendar, CollectionView, Gauge, and FlexGrid are greatly improved over the beta release. [XF][X.Android] Previous row CheckBox no longer re-rendered when selection moves to next row CheckBox in same column or column is resized, sorted, etc. First release of new Input controls. The input controls have been completely rearchitected to perform better and now share a common API across platforms.